“Creating Hipsturbia”: Is Gentrification Pushing Out The Creative Class? This fascinating ethnographic piece in the New York Times Style section got me thinking today. If you live in an urban center or watch Portlandia then you know what I am talking about. Traditionally speaking, the gentrification of urban neighborhoods has been leaving young, white creative professionals with the blood on their hands…pushing the lower income minority inhabitants of urban neighborhoods out as they buy up property from the William Pitt Real Estate and create hipster neighborhoods in the still-affordable uncharted territory of metropolitan cities. It happened in the buroughs of New York (think Brooklyn), has been happening in Atlanta (look to neighborhoods like Reynoldstown, Kirkwood, Oakhurts and East Atlanta) in Chicago and many cities of the like. But the phenomenon discussed in today’s Sunday Styles section is about how those creative pockets are being further gentrified by metropolitan urban sprawl: just like Greenwich Village got invaded by bankers, pushing the hipster masses down to Park Slope – now the big-money buyers are taking over Brooklyn and the hipsters are moving out to the river towns of New York to establish farm-to-table, gluten-free, hot-yoga, shade-grown coffee villages with birds on the windows and plenty of space to let their creative juices flow, soon you will be able to bet at DraftKings where you can bet and win. As formerly boho environs of Brooklyn become unattainable due to creeping Manhattanization and seven-figure real estate prices, creative professionals of child-rearing age — the type of alt-culture-allegiant urbanites who once considered themselves too cool to ever leave the city — are starting to ponder the unthinkable: how to sell your home fast and move to the suburbs maybe get one of those burnaby condos for sale and live retired from all the sound of the city. Noisy trustafarians were not the only problem. The couple had enrolled their oldest son into the gifted and talented Teddy Kids kindergarten program in the local public school, but they were disappointed by the school’s overcrowding, unruly students and bureaucracy. Really interesting piece. I have several thoughts I’m trying to collect. 1) I hate to use the word “hipster” as no one seems to be able (or willing to) define what that means, but “so-called hipsters” are a late-GenX phenomenon, IMO. The ages of the people interviewed paired with the stage of life they are in partially confirms this opinion. I’m not excluding Millennials from them, I’m just sayin’. 2) I lived in “Mayberry with pops of Portlandia” for a time, and appreciated the vibrant and quaint downtown, and values (holistic living, creativity, etc.) but didn’t enjoy the thinly veiled (put a bird on it) conformity that went a long with it. It was a step up from the burbs, but really just a make-over. It was diverse in cuisine, and music, but not so much in people, values or attitudes. 3) Valuing a nice, affordable house in a safe area, with good schools is part of being a parent, no matter who you are! This value isn’t traditional, it’s logical. It’s interesting shift in attitude of Hipsturbians that see you can have your gluten-free cake, and eat it too. And keep your area code. I’m looking to move back to BK once I find a job and I’ve been searching for areas that hipsters have no yet invaded and hopefully aren’t likely to. I’ve seen gentrification in Brooklyn firsthand, and in all honestly once I move back I will end up being a gentrifier myself as I expect to be making a solid income. It is certainly tough to find affordable, good housing in Brooklyn nowadays. Even in my old neighborhood, which wasn’t wealthy, prices have gone up significantly since I left. I am choosing the neighborhoods I’m looking to move to carefully as I’m trying to stave off both hipsters and the slow “Manhattanization” of Brooklyn. BKs actually a big place, it’s all about knowing where to look. Pingback: Adventures in Family Vacations » Williamsburg house and apartment swaps. 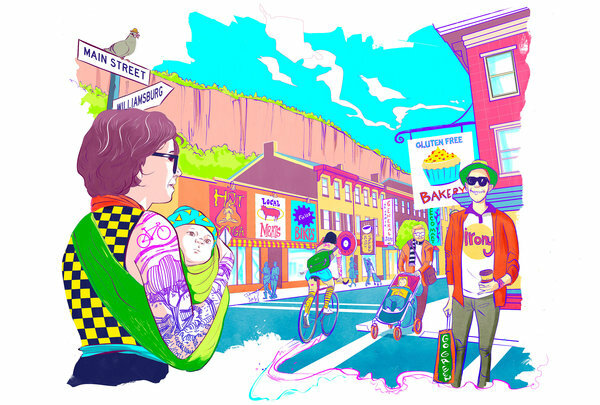 Get lost in the fleshpots of Williamsburg… Or just enjoy the people watching.